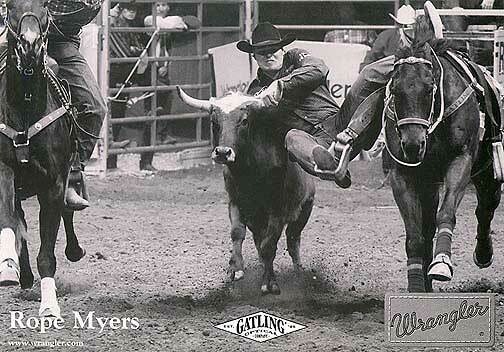 I have always loved watching Rope Myers compete in Rodeos. I was talking with Carol and Hannah Hogner one day about my blog and they mentioned to me that Rope and his wife Candice work with Sky Ranch. I went and looked up Sky Ranch and fell in love with what they do and what they are all about. What led y’all to link up with Sky Ranch? In 2004, I was singing and speaking at a regional FCA banquet in Tyler, Texas. At that time, we had lived in a Van for nine years, but neither Rope nor I knew much about Sky Ranch – – so much of our time had been spent on the road. 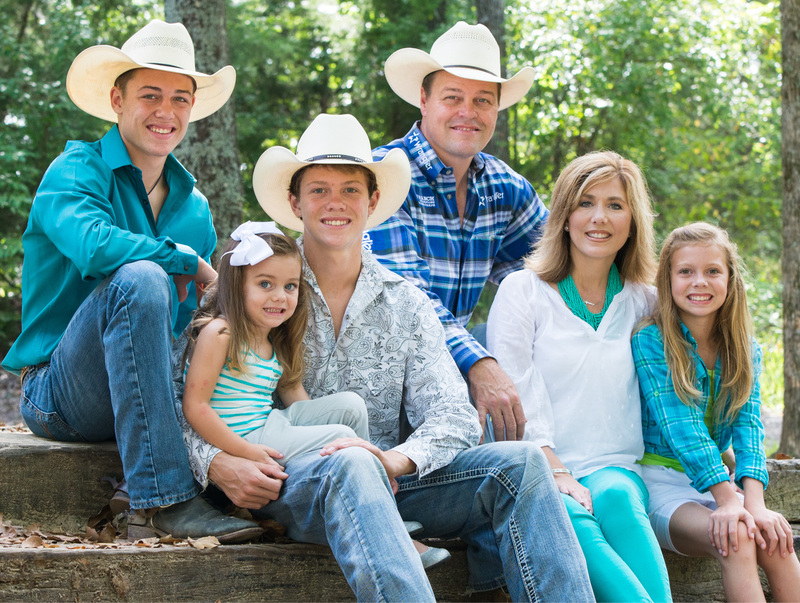 As part of our rodeo and ministry schedule, we were doing several rodeo camps across the country each year. After the banquet, a woman introduced herself to me, gave me her card (she worked at Sky), and told me that she thought the Lord was telling her that I was supposed to be connected to Sky Ranch somehow. A few visits, a tour, and one long meeting later, and we decided she was right. Rope came on in 2004 as a consultant for their horse program, recognizing that at some point, what he really wanted to do was build a rodeo training program that would build champions in and out of the arena. During the 2005 rodeo season, he decided he had been missing too much of our own kids “stuff”, and came home, to a semi-retirement from rodeo. He began plans for building a program called “Champions Rodeo” and the facilities to support it. I continued to travel some in ministry, but also came on staff to help with the marketing and communication of the new rodeo program. My role at Sky Ranch has continued to increase over the years, and I currently serve on the Leadership Team as Director of Marketing. I manage the marketing strategy and team for all Sky Ranch locations – in Texas, Oklahoma, and Colorado. Can you tell our readers what your program is that you offer at the ranch? Sky Ranch is celebrating 60 years of “impacting lives forever”. 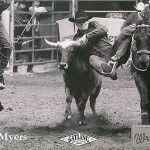 The program Rope is most closely connected to is the one he established – Champions Rodeo. 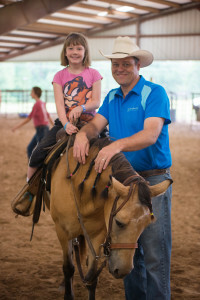 This program consists of a variety of camps – Young Riders- for the beginner – – this is for kiddos just beginning their rodeo career – some are just learning how to ride, and some have a little experience. They are 7-12 years old, and learn the basics of timed event rodeo – horsemanship, barrels, poles, goat tying, and roping. We have three sessions each summer, which are a week long. In addition to several hours in the arena, campers enjoy all of the fun activities at Sky Ranch – the Blob, swimming pools and water slides, ropes courses, ziplines, and more! Sky Fillies is a new program this year, and was birthed out of the need to have a session for early teenaged girls who just love horses, but may not ever compete in rodeo. We are offering it for one full week session in June. Champions Rodeo Clinic is for the more advanced competitor – generally kids who are already competing in rodeo. We bring in world class rodeo athletes like David Key, Lynn McKenzie, Janet Stover, Blair Burk, Jacky Stephenson, Chad Masters, and others, to instruct kids in their chosen area of rodeo. They also have opportunities to share their faith and testimonies with the campers. Over the years, we have been blessed to have so many incredible rodeo role models come through this program and share what they have with these kids. This clinic takes place in August, toward the end of the summer camp season. Elite Rodeo Clinic is for our most advanced competitors – high school and college aged. It is an invitational program that is held over the Christmas/New Year break, and includes event instruction as well as classroom time that covers subjects such as “Marketing Yourself”, “Finances for Rodeo and Beyond”, “Health and Fitness”, “Rodeo 101 – How to Enter, Practice, and Get Down the Road”, as a few examples. We also invite several college rodeo coaches who use this time for recruiting future athletes. How many children a year are you able to touch through this program? Current capacity for all of these programs is about 350 kids per year. As we continue to fund raise, one of the items on our “wish list” is a “bunkhouse”. We currently share cabin space with traditional Sky Ranch camp, which is topping out at capacity each session – this limits the numbers of sessions that we can do each summer. Rope puts a limit on how many campers he will take each session, to ensure the integrity of the program, and individual attention to every camper. What would you say has been the most heart touching experience for y’all while working with these children in your Champions program? Over the years, we have had the opportunity to get to know so many kids and their families. They all have a story. Of course there is no greater joy for us than to witness a camper (or their parent) come to know the Lord for the first time. But lives are impacted in so many ways during these camp sessions. Here are a couple of quotes for you to use: . “My daughter said she came home feeling closer to the Lord. May God bless what each of you guys do there and continue to touch the lives of so many youth!” – Champions Rodeo camper mom “I just wanted to take a moment and thank you and all of the staff which participated in the Elite Rodeo Clinic. (My son) came back with such enthusiasm about everything the camp offered. He immediately said for me to budget for the camp in 2015. The entire experience sounds like exactly what he needed after having such a difficult year in 2014 with his injury. If possible I hope you will let each of the staff members involved know how much our family appreciated them taking the time to instruct and encourage (my son) in rodeo and in life events.” Mom of an Elite Rodeo Clinic student. What’s the greatest need you see at Sky Ranch that we can let our readers know about for support? We have an annual fundraising event called “Cowboys & Cowboys”. 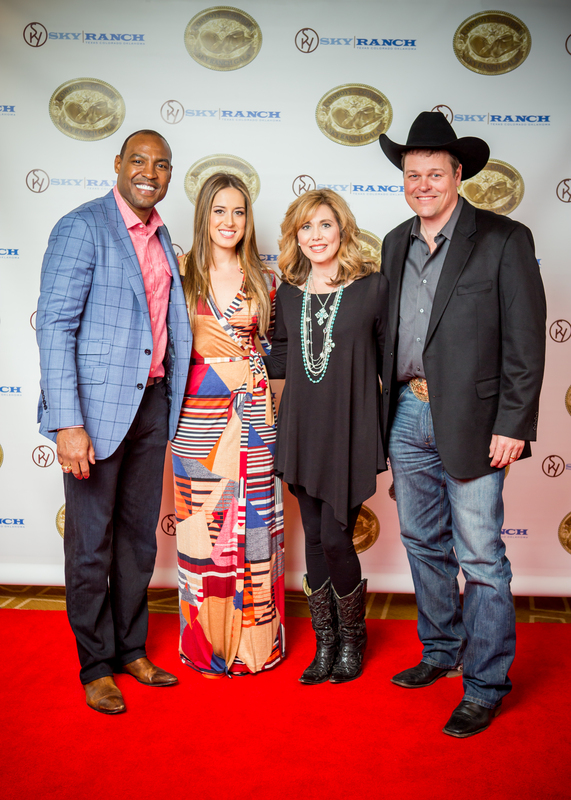 The Gala raises money for the scholarship program and to support all of the ministries of Sky Ranch. This is one way that we are able to send many rodeo kids to camp, who might not otherwise be able to afford to go. Legends of the rodeo arena, along with former and current Dallas Cowboys, show up for the evening to help raise the funds necessary through a dinner and auction. Beyond that, there are always ways that people could help support the rodeo programs specifically – first, with their faithful prayers. Second, with in-kind donations. We serve a very creative God, and have watched Him bring the coolest things across our path – – from big fans for the arena, to outdoor lighting, to dirt work for the driveway and parking area. We do our best to not limit God by the things we think we need. He knows what we need – usually before we do! – and He knows how He wants to provide. 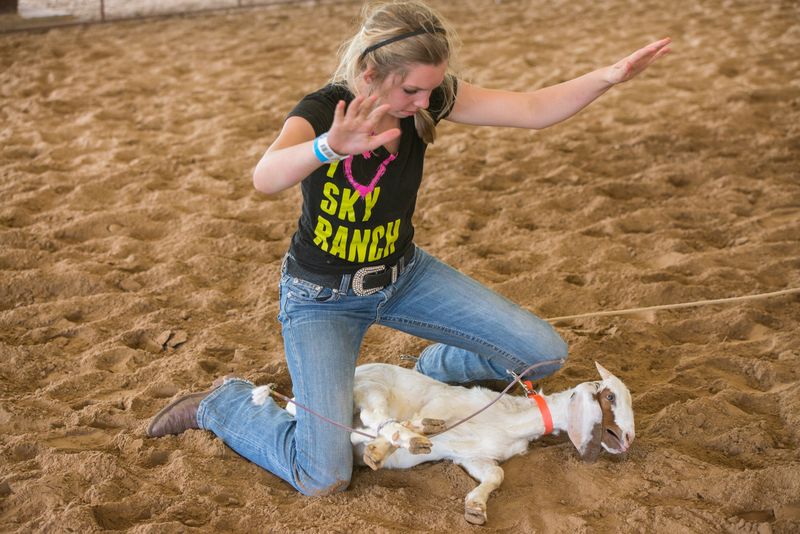 The perfect blend of summer camp and rodeo training school is offered at Sky Ranch Champions Rodeo Clinic. This camp is recommended for young people who already have some rodeo experience. Campers entering grades 4 through 12 get the chance to learn from the nation’s top rodeo experts in Sky Ranch’s two competition-sized rodeo arenas. If you would like to make a donation to Sky Ranch Please check out the link below. This ministry is for sure a fertile place to plant a financial seed. THANK YOU ROPE AND CANDICE FOR SHARING YOUR HEART AND MINISTRY WITH US. THANK YOU FOR ALL YOU DO TO HELP TOUCH THESE CHILDREN’S LIVES. This entry was posted in Blog, Dreams, Faith, Family, Goals, God, informational, Rodeo and tagged Aboveandbeyond, BigDreams, Encouragment, Faith, family, Goals, God, Rodeo. Bookmark the permalink. Absolutely amazing!!! Beautiful story! Thanks for sharing! What a neat ministry/organization!!!! I wish we lived close enough! Thanks for a great post telling people about this. Very cool. I love it when people find creative ways to share their faith and give to the lives of kids at the same time. This is so interesting! We don’t live in a big rodeo area so learning about camps like this is fun. I love the Christian education aspect of it, too. What a wonderful life experience this would be for kids!